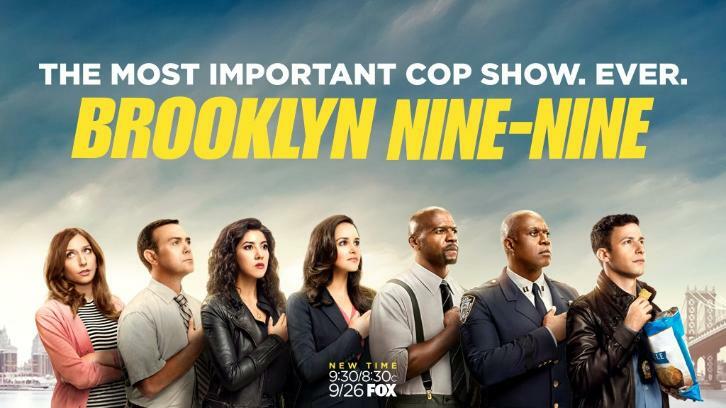 Brooklyn Nine-Nine had it's turn on the Fox chopping block after completing a healthy five seasons, but fans manages to intervene sufficiently for an unexpected save by rival network NBC. But how did we get to this point? Over the years the show's characters have nicely progressed, developed, and evolved along with their relationships one another both as colleagues and as friends. But beyond all that the show was deemed fit for cancellation despite a pretty vocal fan following. So this season has that distinct feel of trying to wrap things up at the last minute in case they hadn't gotten picked up for a future season. Synopsis: Brooklyn Nine-Nine is an American police sitcom television series created by Dan Goor and Michael Schur. As of the time of the writing of this review the show has been picked up by NBC for a sixth season of 13 episodes. The last season ended with Jake (Andy Samberg) and Rosa (Stephanie Beatriz) in jail as they had been framed as dirty cops before they could take down the actual dirty cops led by Lt. Hawkins (Gina Gershon). And as Jake struggles to deal with being moved to the general population of the prison, the rest of the nine-nine are trying to find clues that might lead to them being exonerated of all charges. But of course they manage to resolve this arc quickly enough in order to get the real ball rolling. The latter part of the season ends up revolving around a few key storylines. One is Jake finally proposing marriage to Amy (Melissa Fumero) and then there's the deal that Captain Holt (Andre Braugher) makes in order to help get Jake and Rosa out of prison. And how these major plot points sort of loom over the rest of the adventures of the precinct help define the direction of the show. What I Liked: One of the unusual highlights of this season was Rosa's growth as a character given how she had to first recognize that her thing with Adrian Pimento (Jason Mantzoukas) wasn't really working out and somehow get to coming out as biseuxal to the rest of the nine-nine. This could have been a one-off story point, but they pursued it further including Rosa trying to figure out how to come out to her parents, which was a great episode in itself. And then you have Captain Holt and how the writers used this season to really explore his character a lot more. This arched out to include his partner Kevin (Marc Evan Jackson) and his larger career aspirations beyond running the precinct. And I think they handled all this very well and it help to give the season a lot of heart. What Could Have Been Better: With the need to focus on major story arcs and that sort of meta-plot development, then not everyone gets their proper time in the sun. Terry (Terry Crews) and Boyle (Joe Lo Truglio) were mostly limited to backgrounds gags almost on the level of Hitchcock (Dirk Blocker) and Scully (Joel McKinnon Miller) at times. And let's face it, not having Gina (Chelsea Peretti) around for the bulk of the season really hurt the show as she was a really fun piece at play and did well against pretty much any other character in the show. Her absence was a void that slowed things down and when she did come back it felt like too little, too late for this particular season. TL;DR: Brooklyn Nine-Nine is still a strong show and one that I continue to enjoy. The coming partial sixth season will be a chance to wrap things up even further beyond what had been accomplished in this season and I think we have a solid springboard. Thus the show gets 4 crazy lengths they nine-nine go to help Jake and Amy with their wedding out of a possible 5.